Bad Egg opened just before Christmas last year and is the latest venture from Scottish barbecue guru Neil Rankin, former head chef of Pitt Cue and John Salt. It is an all-day diner with a hipster bent (but ultimately probably aimed at City boys) – the menu is mostly composed of “dirty” meat dishes with a vague Korean theme (well, at least kimchi appears quite frequently on the menu). 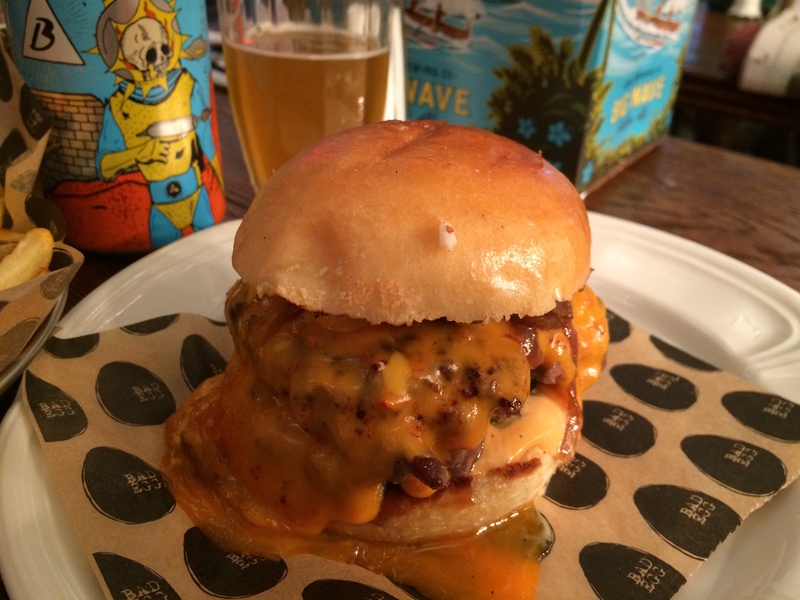 The menu is long and muddled: sub-genres are burgers, ribs, eggy things and (strangely) tacos; pricing is reasonable with the most expensive dish at £11. The set up is you would expect – they have the requisite craft beers on hand (from Beavertown, Fourpure and Camden breweries), the decor is stripped back and the furnishings reclaimed. 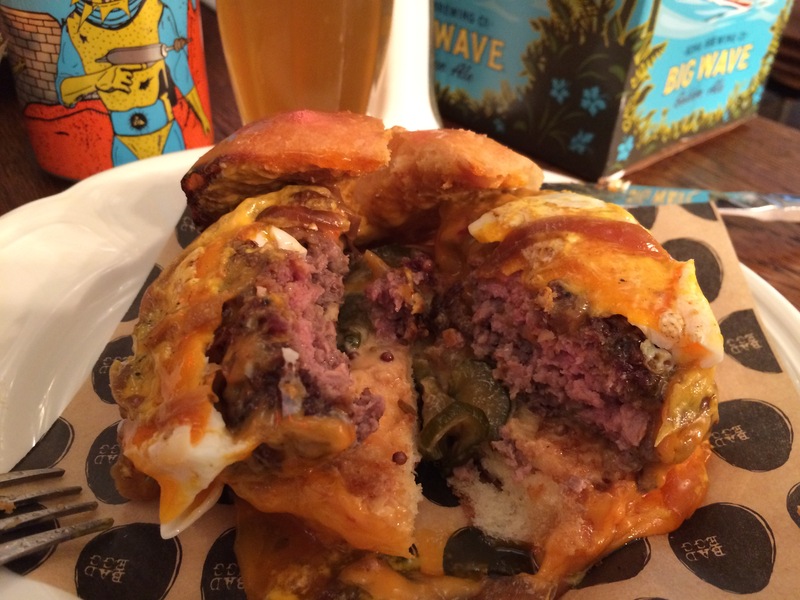 I couldn’t resist choosing the bad egg burger (£11), composed of a beef patty with cheese fondue, pickles, onions and, of course, a soft boiled egg. The burger was slightly smaller than I expected but was well seasoned, cooked nicely pink and came decadently smothered in rich, runny cheese. The cheese fondue was a masterstroke – the cheese was the right strength and was nicely liquid without being stringy or cloying. Disappointingly, my egg was a bit over cooked – it was not as runny as it should have been, although otherwise I was really impressed with the dish. I had kimchi fries (£5) on the side which complemented the burger really well – the kimchi was spicier than average and had very good texture, the skinny fries were bog standard but were brought to life by the zesty kimchi. Service was attentive but ineffectual (they confused our drinks orders and served a pint very shy of the watermark). I then ventured further east for a quick visit to Crate Bewery which is based in a canal-side warehouse a few minutes’ walk from Hackney Wick station. The bar/restaurant is right next door to the brewery itself and owners Neil Hinchley, Tom and Jess Seaton (who are also responsible for the nearby Counter Cafe) have done a great job of converting the former print factory into an open and comfortable space. Unsurprisingly, they have a great range of beers (Lager, Golden Ale, India Pale Ale, Best Bitter and Stout, £3.8-4.5) – I sampled the Best Bitter which was malty with notes of caramel and a touch of fruitiness, recommended. They offer a little range of handmade stone-baked pizzas (£8-12, apparently all devised by Jess and her mum) which are prepared in an open kitchen in the middle of the bar. 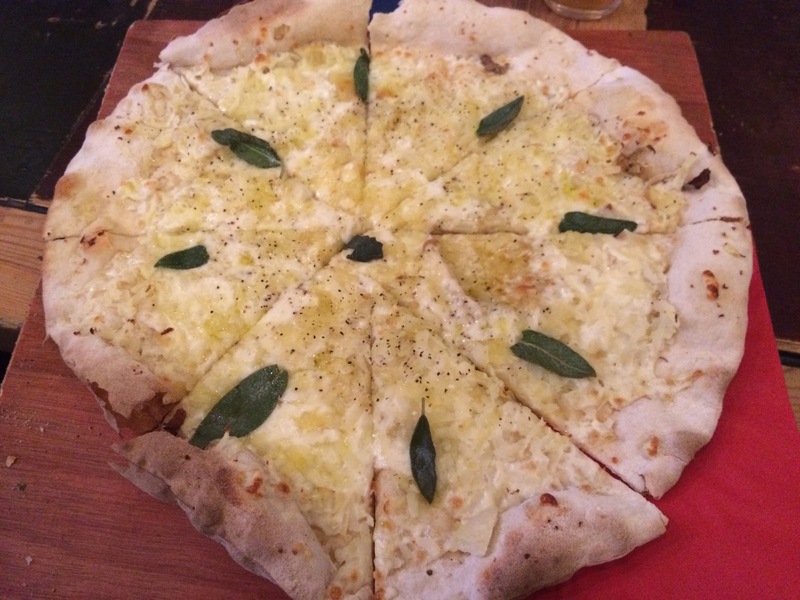 We chose the wackiest of the bunch: sage, potato and white truffle with mozzarella and parmesan (£10). The pizza arrived quickly with a waft of pungent truffle aromas – the topping was thin but very strongly flavoured with the parmesan, sage and truffle all fighting for attention. The potato had been grated over the base and softened the flavour of the other components, also adding texture. We shared this between two and I think it would have been tough to eat a whole one because of the rich and punchy flavours, but a slice or two works very well with a nice hoppy beer. 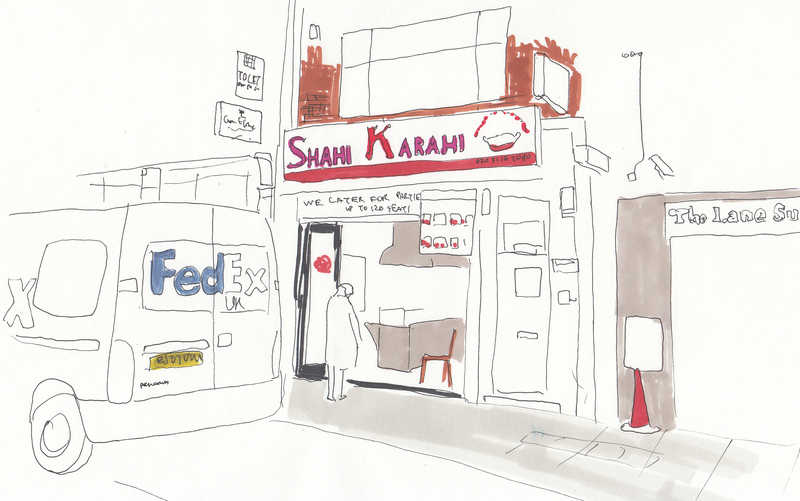 Shahi Karahi is a Pakistani restaurant and takeaway at the (quiet) south end of Brick Lane, they specialise in tandoori grills and kebabs but also have a range of traditional curries. 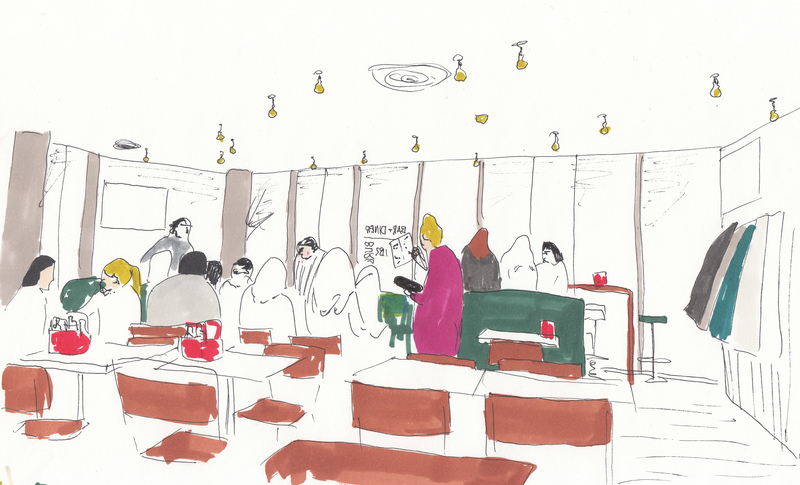 I went along for a quick midweek lunch – their food is fantastic value and they offer a set lunch deal of a meat dish with chips or rice and salad for £6. The set up is pretty basic – they have an open grill at front of restaurant and a dining area with about 60 covers in the back. 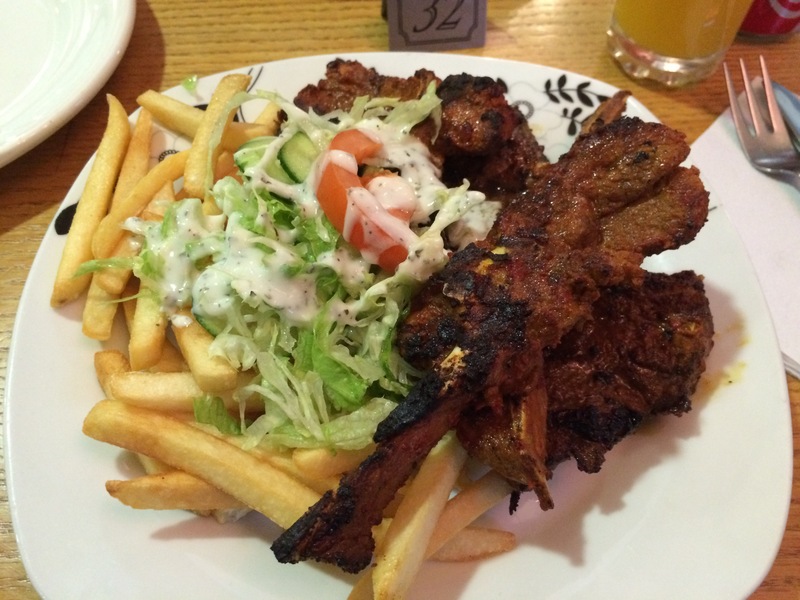 The chops had been first cooked in the tandoori oven and then finished on the grill so they were nicely charred and retained a slightly smoky flavour. Our waiter would not reveal the components of the “secret” marinade but the spicing was bang on – there were hints of coriander leading to a nice chilli kick. The salad was fresh and the chips were cooked from frozen but were nice enough. Categories: Café, Indian, Italian | Permalink. 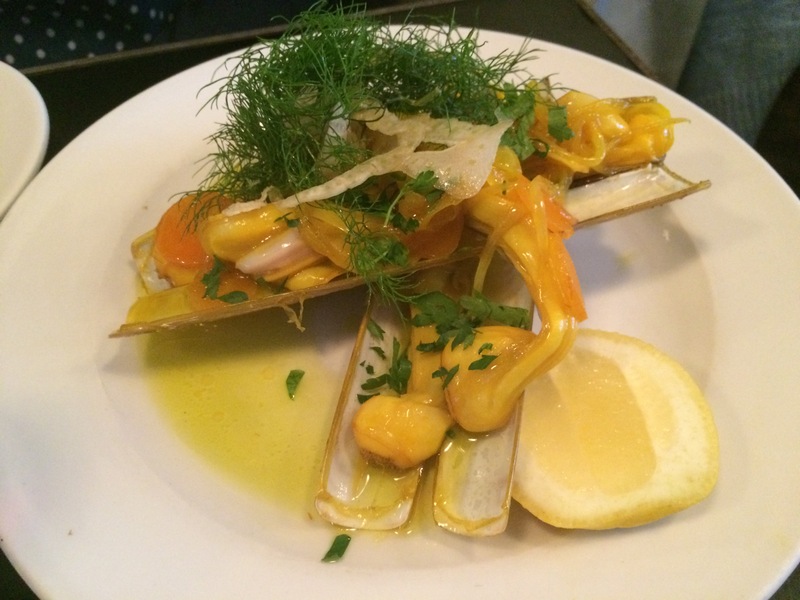 Artusi received a glowing write-up from Peckham resident Jay Rayner a few months ago, but seems to have been off the radar of most London bloggers ever since (North London bias perhaps?). I decided to head along to offer an impartial opinion and to sniff out any potential home-bias from Jay. Artusi is nestled in the recently gentrified Bellenden village, a place where hip new restaurants and artisan butchers sit shoulder to shoulder with greasy kebab shops and Caribbean fruit and veg shops. It’s interior is stripped back using a coolly understated palette of white, grey, slate and charcoal. Plain wood tables are crammed into the relatively small dining area which is topped by an open kitchen. The menu is short, seasonal and keenly priced, with three starters (£5), two pasta dishes (£6 or £10.5 for a larger portion) and three mains (£13) on offer. 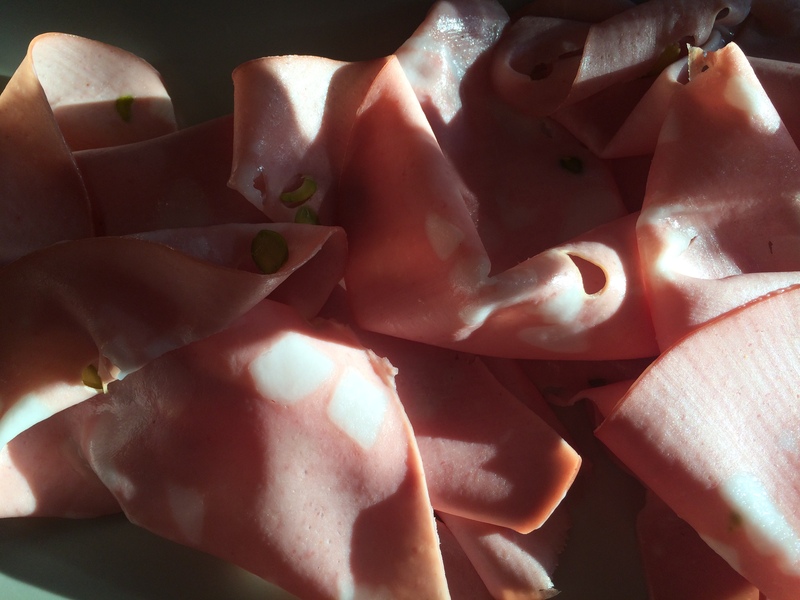 We opened with mortadella – a pork cold-cut from Bologna, laced with garlic and pistachio nuts. The portion was very generous: the fatty, flavoursome, meat had a slight garlic aftertaste – for me, it was very enjoyable but I imagine that some would find it’s richness a bit heavy going. Our other starter was seared ox heart with salsa verde – the meat was served rare but had been properly rested so it almost melted in the mouth. The salsa verde was zingy, lifting the strong flavour of the ox heart and lending clean citrus undertones. 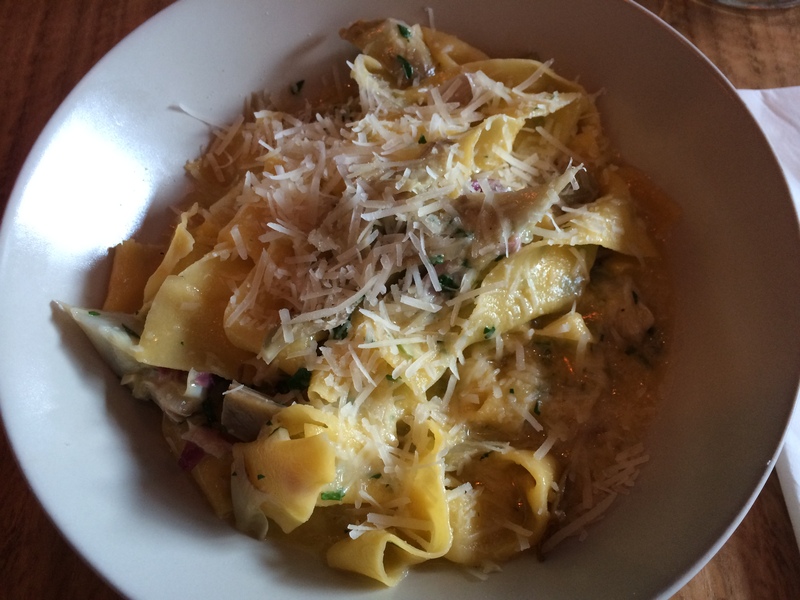 For our pasta main we chose pappardelle with artichoke. The pasta had certainly been made in-house using good quality eggs, giving it a fantastic yellow colour; it was rolled very thinly and cooked so it retained a bit of bite. The artichokes were (I think) steamed and then soused in a butter sauce. This dish was a reminder of the amazing pasta dishes that I have eaten on holiday in Italy – it was by far the best pasta dish I have eaten in the UK. We followed the pasta with old spot pork, beans and artichoke. 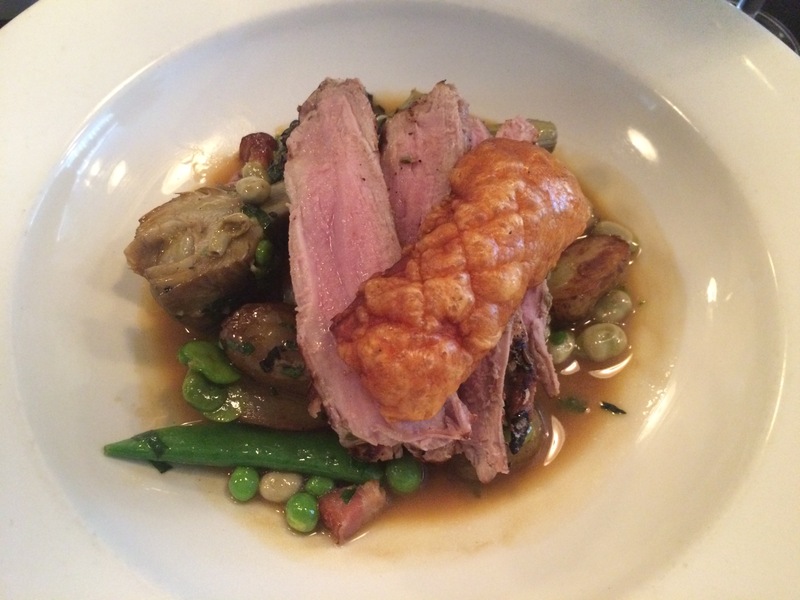 The pork had been slow cooked and was so soft it could have been eaten with a spoon. It had been finished in a little olive oil, with cream and a hint of parsley. 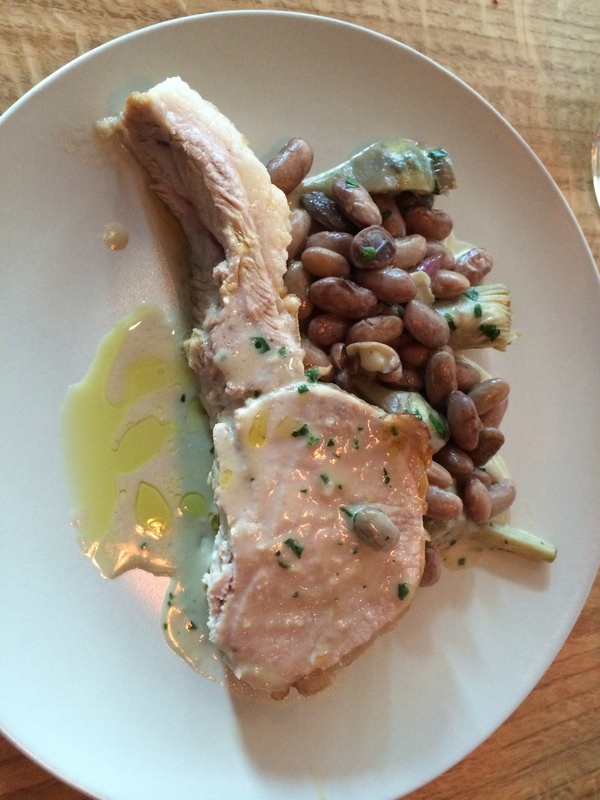 Texture was added by the earthy, nutty beans and freshness by the artichoke. An incredibly simple, but beautifully executed dish. 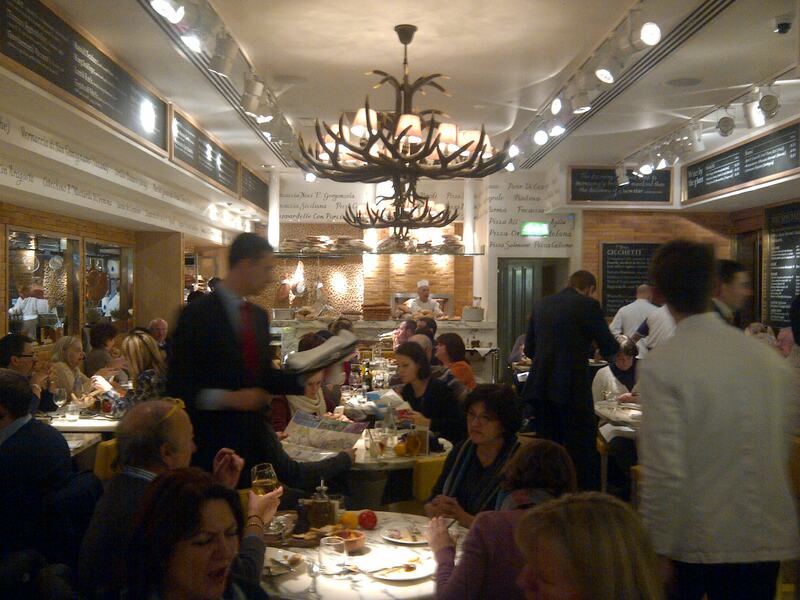 Cicchetti is part of the San Carlo group which owns an upmarket chain of glossy Italian restaurants based mainly in the North of England – they have one outcrop in London, slap bang next to Piccadilly Circus. 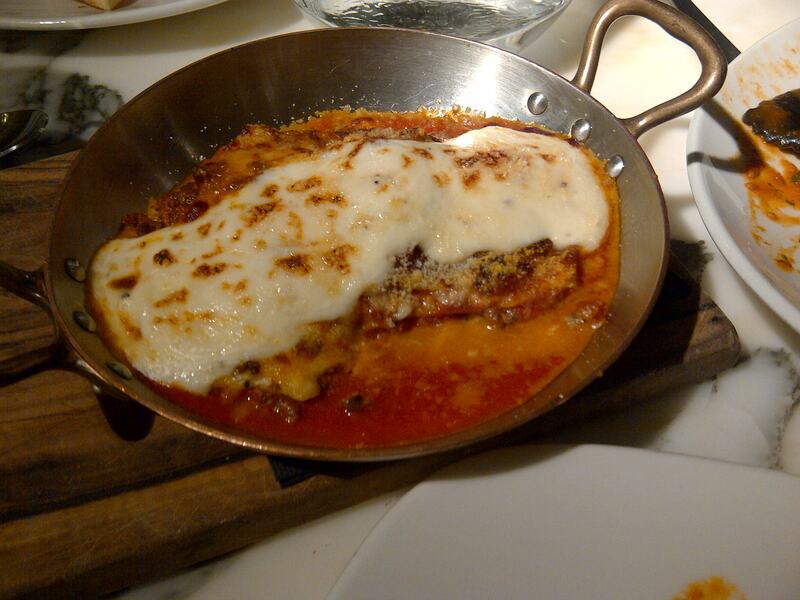 The food is Italian-style tapas designed for sharing; the surroundings are plush and shiny. 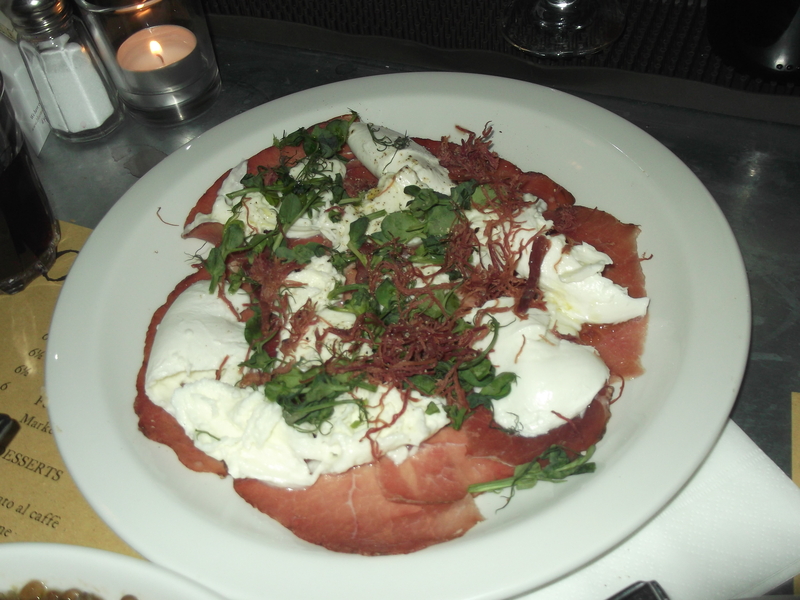 The menu is full of Italian staples (salads, cured meats and pastas) and holds no surprises at all. Dishes range from £4 to £7 but they are pretty small so you are recommended to order at least three each. We started with a rich lasagne which used home made pasta and a fresh tomato ragu, this was followed by a light pizza made with flour which had been cut with a touch of semolina, adding a nice crunch. Our final dish was crab ravioli – the pasta had been mixed with octopus ink and the crab meat was very light and fresh. 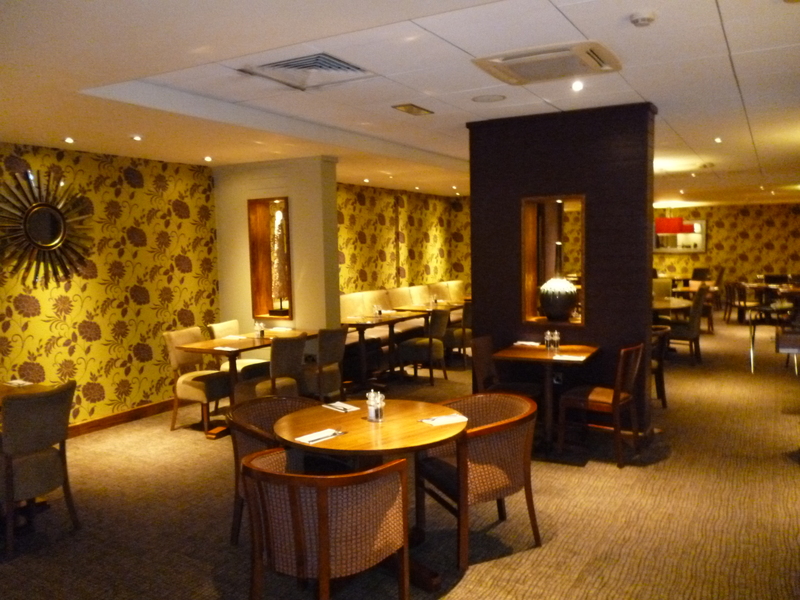 The dining room has a bustling atmosphere which is enhanced by the congenial and expeditious staff. Verdict: whilst the food is not exciting, it is very well executed. Italian sausage and mozzarella pizza. 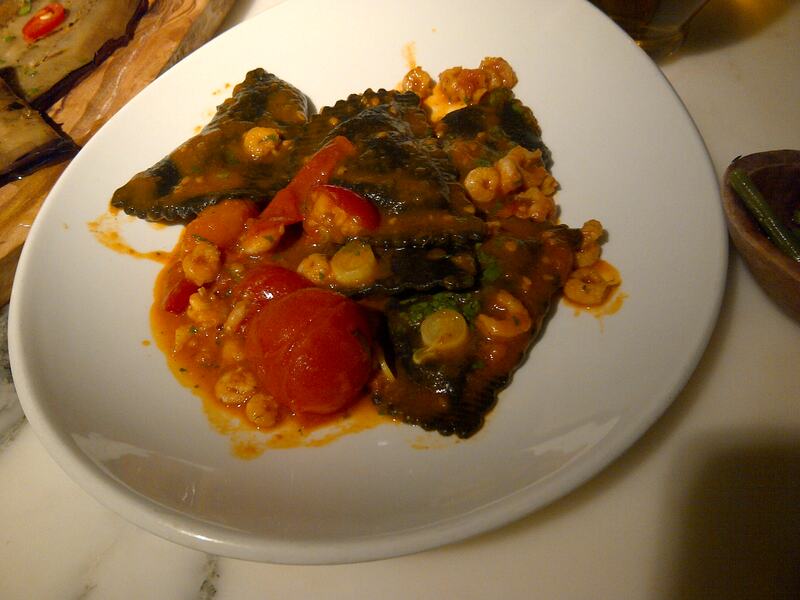 Crab ravioli with brown shrimps and tomatoes. Your intrepid food blogger has covered a lot of ground during his sojourn to London, but an hour on the slow as treacle Piccadilly line (trying to avoid eye contact with the Aussie traveller who seemed to be striking up conversations with tired commuters at every opportunity), with the sole aim of dinner at the Premier Inn seemed like a stretch beyond my capabilities. However, I had a good reason to be heading west, I was going to meet my parents for a quick bite before they flew out on holiday early the next morning. The hotel is actually in Hounslow and is about a 2 minute bus ride from Hounslow west tube (although I am not recommending a special trip!). This was my first visit to a Premier Inn and whilst the exterior was boxy with sticking plaster PVC windows, the lobby was not disgraceful (looking past the Easyjet style self check-in counters). The hotel restaurant was already packed when we arrived at around 7pm, an eclectic mix of languages peppering the air – the atmosphere was actually pretty congenial and certainly better than my imaginings of TV screens, crying babies and piped musac. 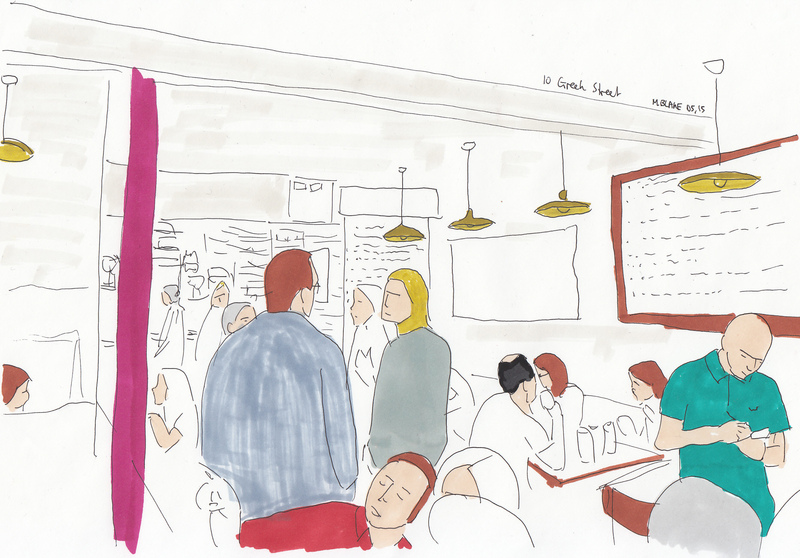 The service was very fussy, along American lines, the waiting staff had plastered on smiles and constantly asked if we were happy with everything. 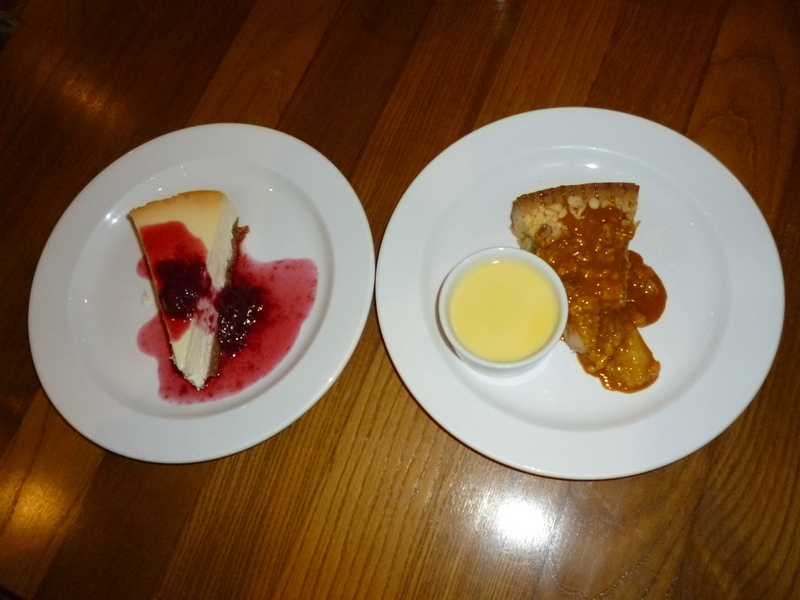 The menu was generic with no dishes standing out in particular – it consisted of a mishmash of Italian, British and French dishes, set out in no particular order. They offer some meal deals (a device that separates the very thrifty from the already thrifty), including 3 courses for £22 including a glass of wine and breakfast the following morning. 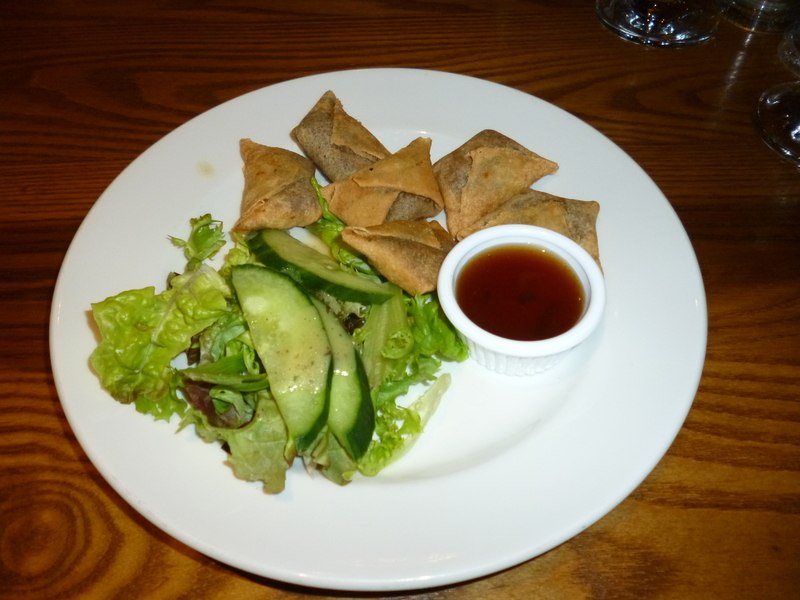 I don’t think that the duck spring rolls that I had to start were made on the premises (!) and they seemed to have come straight from the freezer, but the quality of meat was reasonable and they were not overcooked. The wine that came with our meal deal was a perfectly quaffable unoaked Chardonnay. My main course was supposed to be rump steak and chips – when it arrived it looked very appetising, but the meat was as tough as an old brogue. Dessert consisted of defrosted profiteroles which tasted like balls of squirty cream with an old evening standard wrapped around them (but at least they were cheered up by a pretty decent toffee sauce). The Premier Inn experience was marginally better than I was expecting: the staff tried very hard and the quality of cooking wasn’t terrible, but the ingredients were. Categories: British, French, Italian | Permalink. 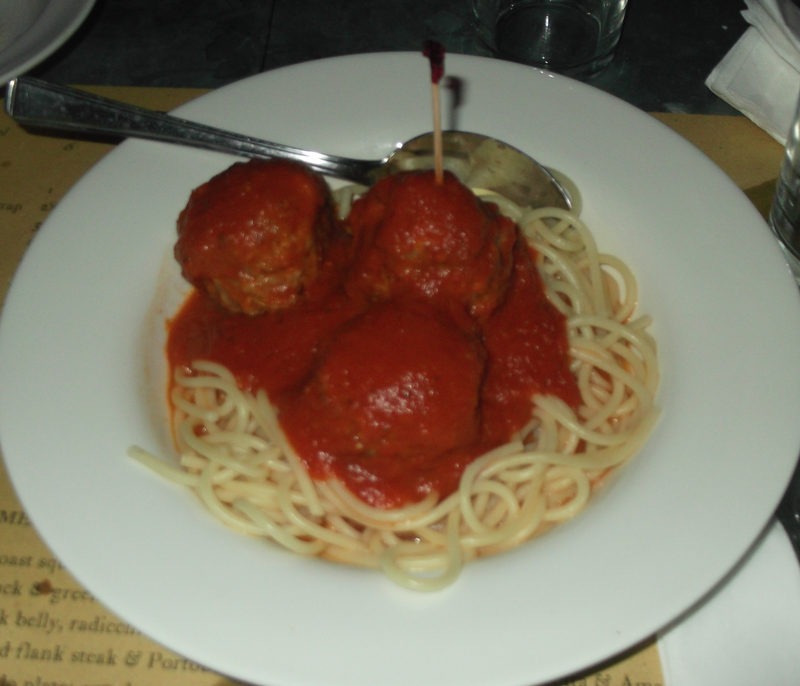 Polpo is Venetian and serves Italian style tapas – it has a wide menu with a focus on their homemade meatballs. Like all new London hipster joints, they do not accept bookings and are extremely popular so expect a wait, but I would recommend heading downstairs to their funky little bar for a pre-dinner drink (it looks a bit like the kill room in a Victorian butchers but somehow manages to maintain a great atmosphere). The cocktails are on traditional lines (manhattans, whisky sours etc.) but have an Italian twist because they make use of Polpo’s great selection of Italian spirits. The dining area is small, dark, noisy and crowded, with quite a few high seats directly at the bar. A knowledge of Italian wine would be useful for tackling the wine list – we could not make head nor tail of it, but managed to pick a great bottle by sheer luck. 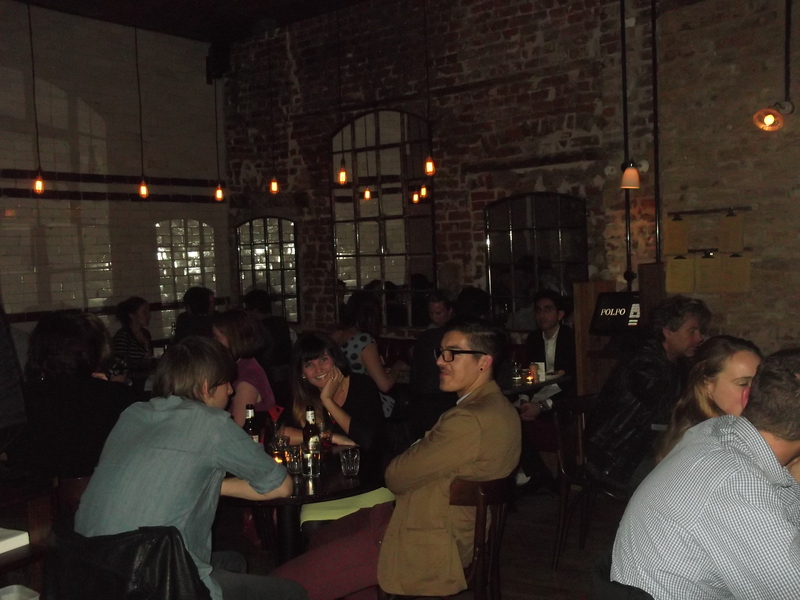 Our starters were small and pretty uninteresting – anchovy and chickpea crostino (£1) and pickled artichokes (£3). However, our selection of mains was really fantastic – melt in the mouth pork and fennel meatballs (£6.50), succulent cod cheeks with firm, earthy lentils (£8), a rich pork belly with great crackling (£9) and an unfortunately overpriced but very fresh selection of home cured meats with creamy buffalo mozzarella (£14). My memory may have been somewhat hazed by the cocktails and wine, but I thought these dishes were absolutely outstanding – the meatballs were by far the best I have ever tasted. I left no room for dessert, but the ricotta and cherry cannolis looked very good. 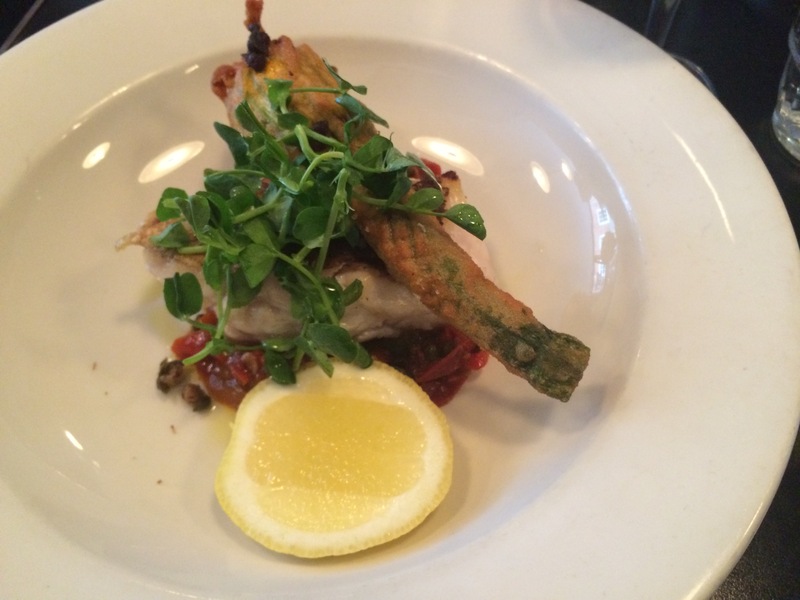 The food at Polpo is simple but very well executed – it is well worth a visit. I recommend arriving early in the evening to beat the queues and enjoy a pre-dinner cocktail. Also see: londoneater, Faerietale foodie and Crump Eats. 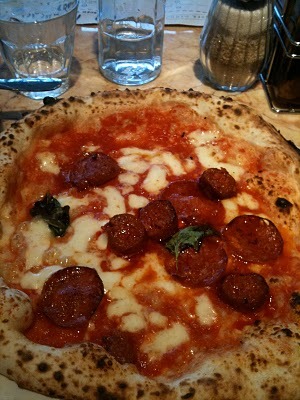 Warning: stay away if you do not like pizza, it is all they have on the menu! How long would you wait for a pizza? 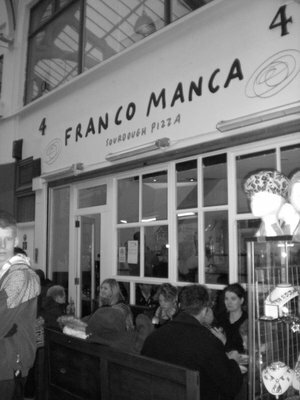 On Friday night I queued for an hour and a quarter for the now famous Franco Manca sourdough, surely the hottest restaurant in the buzzing Brixton Village. The pizza was pretty good, but I am not sure that it was worth such a long wait. The whole experience was rather fraught, with a lot of pressure to eat up quickly and the staff running around like headless chickens, occasionally garnishing pizzas with drops of perspiration from their foreheads. Franco Manca is known for its sourdough pizza bases (all their pizzas are made from this) which are left to rise slowly without adding yeast, resulting in a soft and light base. They also have a special wood burning oven that reaches around 500C, allowing a very quick cook and keeping the base nice and thin. The menu only has 6 options, all hover around £7 (certainly great value), and there are a few more daily specials. 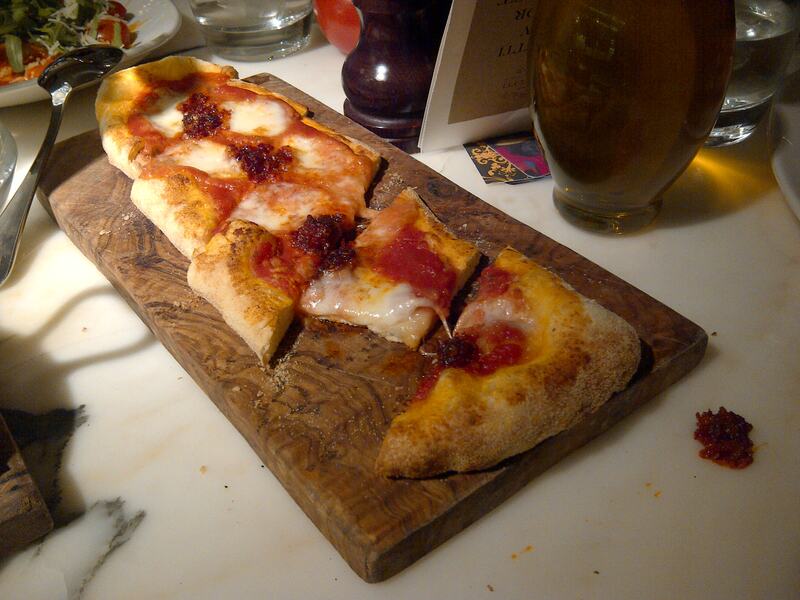 The dough is fantastic and the ingredients are very fresh – the menu states the sources of all the main ingredients (including what UK ingredients are used at various times of the year) which is a nice touch. First I sampled the courgette, basil, buffalo ricotta and pecorino (£6.75 -the waitress offered tomato sauce with this but I would recommend having it without). This was unusual but very enjoyable: the slight bitterness of the crunchy pecorino was nicely offset by the fresh, sweet courgettes, with the beautifully creamy ricotta sitting in the background. I would also recommend the tomato, chorizo and mozzarella (£6.95) which was less adventurous but allowed focus on the famous base and crust which were light and melt in the mouth; the chorizo was not chewy or greasy and had only a hint of spice. Franco Manca offers great value pizzas, but if you are of a gentle disposition I recommend avoiding it on Friday and Saturday nights! 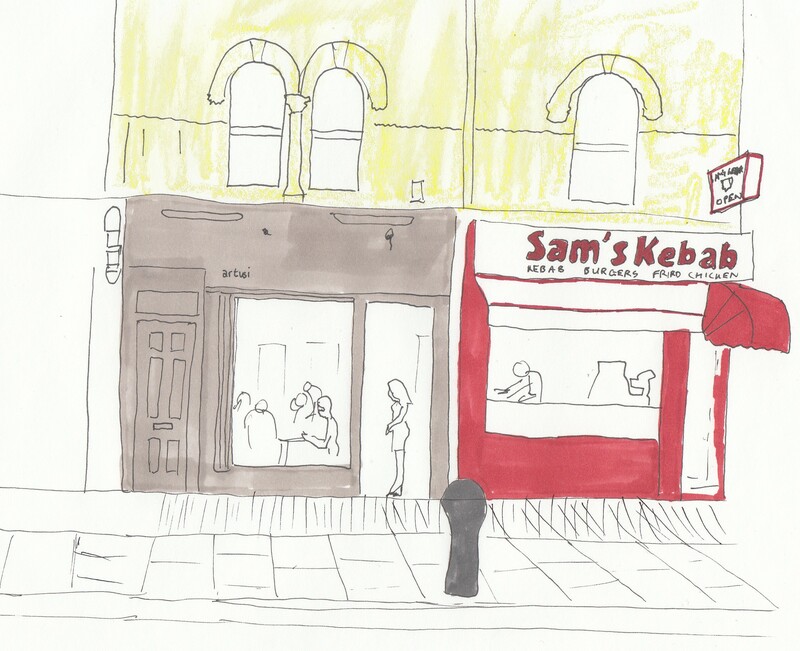 Also see: londoneats, thelondonpizzablog and theswfoodblog.